Purchasing Gift Cards/ Scrip and earning dollars for PHS's Grad Night is easy! 1. Complete the order form available in the Main Office and on the Prospect High School website (found on the Home Page under Resources/Quick links/SCRIP) and drop off with your check or cash payment to the school main office. Make check payable to “Prospect Grad Night”. 2. Orders are processed weekly on Tuesday morning and at additional times if you notify Sandy at rsblack@pacbell.net. 3. Most orders will be filled within 72 hours. If scrip is not in stock, you will be notified by email and your order will be filled in approximately 7-10 business days. 4. You will be notified when your order is available and delivery/pick up will be arranged at that time. Any questions regarding Scrip? Contact Sandy Black at rsblack@pacbell.net or 408-374-7059. If you have other appealing items available for raffle prizes, please let Pauline Berns know at pberns824@yahoo.com. If you would like to help with a monetary donation, any amount is greatly appreciated and all contributions are tax deductible (tax ID will be provided). They can go towards scholarships for tickets, busses or activities at the event. Please supply us with your name/business name if applicable, address, email and phone number when donating. Major donors ($200 and above) will have their name printed on the back of the graduation program for the graduation ceremony. Please make your check payable to "Prospect High School Grad Night" and address the envelope "Grad Night 2015" then hand in at the main office or activities office. Thanks! On the night of Thursday, June 4th, the new Prospect Grads will be celebrating their Graduation event at a secret, safe and very fun location! For this party we need parent volunteers to help with chaperoning the students on and off the buses and at the venue itself. Even if you only have a couple of hours to spare, we'd love your help - and by the way - you'll have fun! Please contact our Grad Night Volunteer Coordinator, Shirley Wreaks, with your availability. You can reach her at: swreaks@hotmail.com or 408-307-8093. Please let us know how you can help! Yearbook Senior Baby Ads are a wonderful way for parents, families, and friends to commemorate their Prospect senior’s high school memories. Using photographs and messages, you can create a special memento in this year’s yearbook—a permanent gift that your child will treasure. All ads will be created by parents online, giving you complete creative control over the way that Baby Ad looks in the yearbook. You can upload your photos, select your layout, add your text, and design your ad. Go to the Baby Ad website and enter code 12100 for further instructions and to get started. Don't miss out on our early-bird special. From now through November 30th, take advantage of our discounted prices on Senior Baby Ads. Our regular Baby Ad prices will go into effect December 1st. The deadline to buy, create AND submit your ad is March 18, 2016, but space is limited, so purchase yours today to be sure to get a spot. We can’t wait to see what you come up with!! Scrip is one of the ongoing fundraisers that the Grad Night committee has been doing for the past few years. Purchasing paper Scrip and earning dollars for PHS's Grad Night is easy! Complete the attached order form and drop off with your check or cash payment to the school main office. Make check payable to Prospect Grad Night. Orders are processed weekly on Tuesday morning. If requested items are in stock, orders will be filled within 72 hours. If not in stock, you will be notified by email and your order will be filled in approximately 7-10 business days. You will be notified when your order is available and delivery/pick up will be arranged at that time. 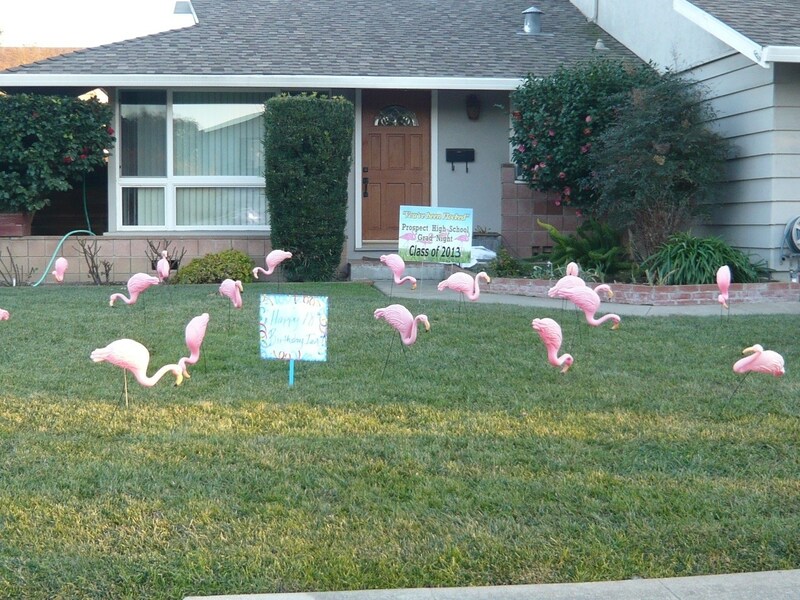 An example of a flocked yard.